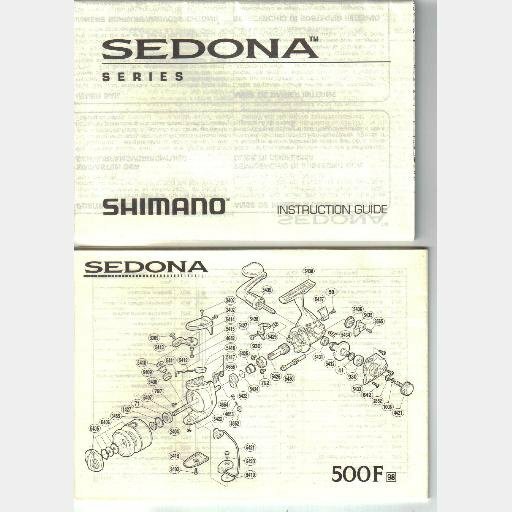 Here are a SHIMANO SEDONA Reel series INSTRUCTION GUIDE and Parts List. OEM and published by SHIMANO for 1997-1998 fishing reels. This is the documentation that would normally be provided in the box with a new reel. INSTRUCTION GUIDE is a fold-out guide printed in English, French, German, Italian and Spanish. This is an OEM Manual, not a copy. PARTS GUIDE is a fold-out guide, OEM, printed in English and French, that shows an exploded view and parts list for the 500F 1000F 2000F 4000F 6000F reels. Items are like new condition, appear unused. NOTE: This offer is for the Manuals only, no hardware or equipment included. Shipping is by USPS First Class Mail with 1-2 week delivery time. AK, HI, and Canada shipping is Priority Mail.